Our sliding bar report cover is a common file holder designed to keep A4 paper documents. It is not only low priced, but also easy to use. If you want to impress your readers from the first glance, choose our sliding bar report cover, because it will provide your reports with an extra sheen of professionalism. 2. This sliding bar report cover comes in various colors, such as blue, red, grey, etc. 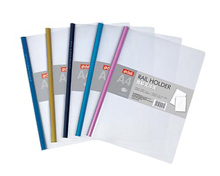 Deli Stationery is a Chinese sliding bar report cover manufacturer. We provide a wide range of products, such as stapler, paper punch, paper trimmer, pencil sharpener, fax paper, glue sticker, and so on. Based in Ningbo, Zhejiang, we have easy access to air, land, and sea transportation, which not only reduces the transportation cost of our raw materials, but also greatly decreases the shipping cost of our customers. We welcome international customers to work with us. We look forward to working with more customers worldwide. » Swing Clip FileOur swing clip file is primarily used to keep A4 files and documents. It is made from high quality PP material, and has the features of being beautiful, durable, and tear resistant. Today.